As the ALS #IceBucketChallenge geared up last week, I thought about writing a reminder on social media about other diseases and charities, such as NAMI (National Alliance on Mental Illness). But I didn’t want to distract from a good cause, such as fighting ALS or any other disease. Hearing about Robin Williams’ death was a bit of a punch in the gut. Like many people, I thought about how sad it is, how difficult of a battle he must have been fighting, how brilliant of a soul the world had just lost. I think it’s opened up a new conversation about mental illness and the struggle with depression, anxiety and a whole host of other diseases faced by so many people. I’ve seen quite a few insightful posts and articles in the last couple of days…but I’ve also seen some that made me draw my breath sharply and shake my head. I waited a couple of days to write this, even though it has been tugging at my heart all week. My close friend of more than ten years took his own life in April of 2013. 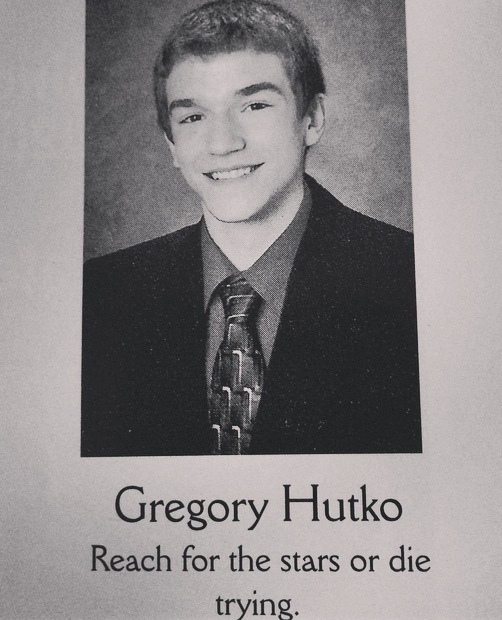 Greg was a brilliant, sweet, kind young man who seemingly had everything the world could offer. I will never forget that phone call from his sister. Of course, part of it was the realization that I would never get to see him or give him a hug or laugh with him again. But part of it was because Greg’s family was so open about what he had been going through and they wanted people to know what had caused his death. Greg had recently been diagnosed with bipolar disorder. Before you begin thinking, “He didn’t try hard enough to fight it” or “Depression and anxiety get better,” let me just point out a couple of things. Would you ever say about someone who died of cancer, “He or she didn’t try hard enough” to fight the disease? Or someone with schizophrenia, for example? Chances are, you would feel bad for them and recognize that sometimes, you do what you can to fight it…but the disease does the rest. You don’t choose mental illness, the same way you don’t choose cancer or any other disease. I’ve also heard people say that those who suffer from it must not believe in God or religion. My God can heal anyone. I firmly believe that. But the fact is, people die all the time from various diseases. My grandfather died of cancer. I’ve seen many, many people die from other things. Accidents, car wrecks, diseases. I believe He is capable of healing beyond what any of us can imagine. I’ve seen it. But I also see people die from other causes all the time. To think that someone “wasn’t trying hard enough” — I don’t think that’s a good representation of how depression affects you. Robin Williams “had it all,” that’s for sure. Brilliant actor and comedian…Academy Awards. Emmy Awards. Golden Globes. Possibly one of the most renowned and funniest people the world has ever known. I’m sure he was incredibly wealthy too. My friend Greg “had it all,” too, by many standards. He was an exceptional athlete and even a marathon runner. He went to MIT, where he was also a tutor for high school kids on top of all his college work. He was involved in tons of community outreach, did Teach for America, worked in D.C. for a think tank and did economic research. He was the type of “smart” many of us can’t even comprehend. When I last saw him, several months before his death, he was getting ready to begin a doctorate program in Michigan. When I last spoke to him, about a month before his death, he had changed his mind and decided to keep working in D.C. for the time being. I’ve heard people say, myself included, when someone dies from suicide: “What a waste.” A waste of potential, a waste of the person’s unique gifts, a waste of the time he or she could have spent here on this earth…cut short. But if someone has gotten to that point, gripped by depression, where suicide is the only option…it’s not a choice anymore. It’s what he or she feels is the ONLY option. It doesn’t mean you haven’t tried. It doesn’t mean you want to leave family and friends behind and let them suffer. It means you have tried with all your might to “fix” yourself or “fix” your life and you cannot see any way to continue. It’s an utterly hopeless and horrible situation in which to be, and it happens to so many people. Silently, because mental illness is stigmatized and even those who suffer from it frequently don’t want to talk about it. I don’t know what Robin Williams’ last days were like, or the battle he was fighting. I don’t know what Greg’s battle was like. I don’t know what Brad, a coworker of mine who died by suicide in college, was thinking. I hope they knew people cared for them and that they weren’t alone. I do know how I’ve felt in my most hopeless moments. I do know that I’ve been blessed with family and friends who hear me out and are there for me in my darkest moments. Not everyone has that. If you struggle with depression, anxiety or any other mental illness…know you aren’t alone. Reach out to someone. Talk to someone, whether it’s a friend or family member or a complete stranger or someone on a hotline. During my junior year at Cornell, there were several suicide deaths in a very short period of time. Our University President put out a statement to the Cornell community and he wrote a line that has stuck with me to this day. This week, and going forward, while we are raising awareness for another absolutely debilitating disease, and while we are mourning the loss of a brilliant actor and comedian, please keep mental illness in your mind. Remember that sometimes illness is not something you can see when you look at a person from the outside. EDIT, 11/28/2017: As I reread this post, I edited the phrase I initially wrote about a coworker from college (“committed suicide”) to read “died by suicide.” The former is an outdated term that implies someone has committed a crime by taking his or her own life. Posted on August 13, 2014 November 28, 2017 by Olivia FecteauPosted in UncategorizedTagged #itstime, anxiety, bipolar, depression, mental illness, NAMI, robin williams. Olivia – this is beautifully written. Thanks so much for posting. Beautiful, insightful and spot on. Thank you for having the courage to share your story. I always hesitate in writing something like this because it is real and intimate and, most of all, stigmatized. But that stigma surrounding mental illness is why it needs to be spoken about, addressed, pushed into the public consciousness until it cannot be ignored. Greg and I were friends not just because there was something magnetic about him (even in his early middle-school-combover days) but because there was always an undercurrent of connection between the two of us. Possibly I recognized something in him that I saw in myself, maybe the reverse. Maybe both. What I do know is Greg’s death was, to me, a haunting parallel to my own life that I’m rarely (if ever) open about. I wrote earlier that I saw a lot of myself in Greg, and unfortunately I never knew how true this was. To say I struggle with mental illness is an oversimplification. Over the past seven years, I’ve gathered an impressive range of diagnoses from bipolar disorder to borderline personality disorder to major depressive disorder to whole hosts of combinations of the above. Despite years of therapy of all kinds and inordinate amounts of medications running the gamut from antidepressants to antipsychotics and mood stabilizers, mental illness has continued to take from me. I was dismissed from two colleges after attempts on my own life. It has taken away my dream of going to medical school. It has pushed away my family and friends. It has done nothing but take, take, take. There is a certain horror in the thought that our minds are trying to destroy us, especially for those like myself or like Greg, who are bright and ambitious and see our minds as one of our greatest assets. How are we supposed to trust our brains when mental illness makes it so we can’t? I try to find pride in my small victories, whether it was finally graduating college this past May or getting accepted to pharmacy school, but I live with the inherent uncertainty that winning these battles does not mean that I’ll win the war. Most days I believe the opposite is true. Most days I’m convinced it will get the best of me in the end, a thought that has anchored itself into my brain. It fills me with tremendous guilt to think that my first thought upon hearing the news of Greg’s passing was not sympathy for those left grieving, but empathy. I believe that in itself makes a powerful statement about mental illness. I was sad, yes, but above all, I understood. I don’t and will never claim to really know about his struggles…we each fight our own demons…but there’s a tragic unity that I believe can only be shared by others with the same cross to bear. I know because I live it, every moment of every day. I know the desperation of constantly battling with a mind that is trying to destroy you, and I know the temptation of wanting to finally say, “I’m done,” and lay down your sword. I know that feeling when it’s the disordered thinking itself that drives me and I know that feeling when it’s simply my exhaustion from fighting that’s become too heavy to bear. To understand that place is not something I would wish on anyone. To understand that place is hell. It is not about being “happy” or “getting better” because, for the most part, it’s about surviving. And that’s something that is hard to understand for most people. It doesn’t matter how successful you are, or appear to be, or want to be. Mental illness does not discriminate and it feeds off of the inherent desire to keep it to yourself. The shame tells you that asking for help is weak, that you are weak if you do it; help is for people who “deserve” it, and you are not one of them because you’re simply not trying hard enough. But if you ask for help, it’s an admission of abnormality, of being less-than-okay, of sticking this horrible label on yourself that says “I’m mentally ill” that you’re stuck with and suffer the consequences of. I’ve been trying to be more open about my story because once I finish my PharmD I’d like to specialize in psychiatric pharmacy, and there’s no other way to explain why other than I know what it’s like when the tables are turned. I know what it’s like to be that patient because I was that patient. I know what I’d like to see changed about the mental health system, about treatment, about the way it’s viewed in society. I try to use my experiences to make me a stronger person and a better future professional in that field, but I’m all too aware that even having made it this far is no guarantee. Greg is proof of that. It’s a constant struggle. The best we can do is be open with ourselves and each other, to provide unconditional and nonjudgmental support to those who need it in whatever way they need it, and educate. Didn’t mean to hijack your post, which was beautiful as always. It’s just something that has been stewing in my brain for over a year and it’s becoming more and more obvious that there’s a desperate need for openness and education so we can work on removing the stigma of mental illness. I’m bi-polor and found what you wrote spot-on. My mental illness is always simmering in my brain. I can’t control it. I hide my true feelings and put up a front of happiness. It’s exhausting and sometimes I’m so overwhelmed by it that I end up isolating myself so I don’t have to deal with it. I’ve been to that space of darkness and despair. I wanted so much to shed my existance here on earth to end it all..I tried and was so angry at myself that it wasn’t successful. Since then I truly believe that you can be suicidal and not want to kill yourself. There are moments that I experience in my life that I feel I can’t take another minute of my pain. I hate to breathe when I wake up and have to face another day. I hate that I have to hide my true feelings behind a smile. So, here I am…breathing. I can’t escape the overwhelming feelings I sometimes have. Today I will put on my happy face and face it head on. It’s what I do best. Thank you for writing this. Depression is hard to explain to a person who has never suffered from it. I think this is a good start.